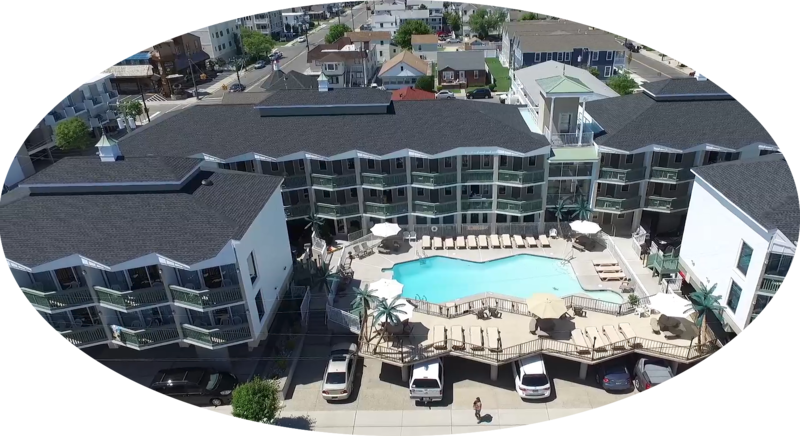 Wildwood is the crown jewel of the Jersey shore, boasting mile of beach for relaxing, water sports and special events and all sorts of activies. Wildwood's boardwalk offers something for everyone! Whether you are looking to bike the boardwalk, visit the amusments on the piers or enjoy the nightlife, it's all here. The Ala Moana Is known for many wonderful amenities, one of the most popular is our large pool, surrounded by lounge chairs and tables for your enjoyment. The Ala Moana Resort Motel is one of Wildwood's hidden treasures. Whether you want a suite, a condo, or a house, all of our accommodations are completely updated, offering many amenities. For your comfort, every Ala Moana room has a balcony, ceramic tile floors, brand new fully equipped kitchen with granite countertops, full-size stainless steel refrigerator, two burner electric cook-top and microwave, central air conditioning/heated, one or two TV; 42" flat screen TV, and daily maid service. Only a block from the beach, we are centrally located so everything you need is close. Outside the Ala Moana, Wildwood has miles and miles of gorgeous shoreline. Known for its boardwalk and expansive beaches, Wildwood is a top vacation destination. Whether you want to relax in the quiet of crashing waves or visit one of the piers with its amusements and shops or party and dance all night, this is the place to be. You can find it all and the Ala Moana is at the heart of every thing.